Samsung vs. Acer Mixed Reality headsets: Which handles VR best? One is a serious competitor to the Oculus Rift and HTC Vive. Samsung's HMD Odyssey is everything we want from a high-end VR headset. In many ways, it even bests the Oculus Rift and HTC Vive, thanks to its gorgeous screens. Still, it's a big investment to make on Microsoft's fledgling Mixed Reality platform. Be the first to review the HMD Odyssey? 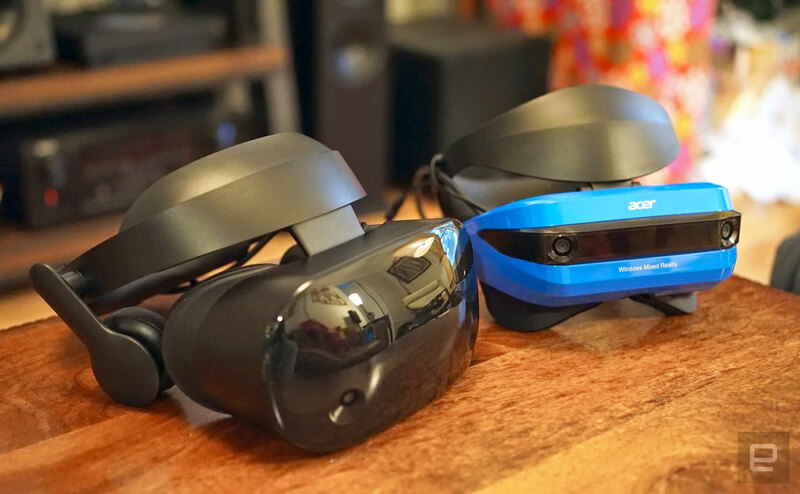 Acer's Mixed reality headset was one of the first available Windows VR devices, and it shows. It feels cheap, it's hard to wear and its screens can't hold a candle to the competition -- especially Samsung's HMD Odyssey. Be the first to review the Windows Mixed Reality Headset? The difference between Samsung's and Acer's headsets is immediately clear. The only thing remarkable about Acer's aesthetic is the glossy-blue plastic visor, which, together with the rest of its design, makes it feel like a basic headset. It's a bit flimsy, almost as if it would break apart if it tumbled to the floor. Acer's choice of materials isn't inspired either, especially the cheap foam around the eyepiece. To the company's credit, the faux leather cushioning on the top and rear portions of the headband feels decent. Samsung's HMD Odyssey, on the other hand, is simply striking. That makes sense though. It was always intended to be a high-end showpiece for Microsoft's Mixed Reality platform. While it, too, is made of plastic, it's of a much higher quality than Acer's device. It looks and feels classier, and it's clearly sturdier. The built-in AKG headphones are also hard to miss: They give the entire device the aura of an expensive pair of audio gear. Samsung's headset is much heavier than Acer's -- it weighs 625 grams versus 380 -- but the plush cushioning around its eyepiece and headband still makes it comfortable to wear. Samsung's headset even feels more premium than the Oculus Rift and HTC Vive. That's because the company was able to learn from those earlier headsets. The HTC Vive still gives off the impression of being a complex device meant for super geeks; the Oculus Rift is admittedly more consumer friendly but lacking in flair. Compared to the PlayStation VR, the most popular headset out there, Samsung's offering feels less like a toy. You'll notice even more dramatic differences between the two headsets when you examine their displays. Acer's relies on two 2.9-inch screens running at a combined resolution of 2,880 by 1,440 pixels, with a 100-degree field of view. Samsung's, however, uses larger 3.5-inch AMOLED panels, each of which boasts 1,440 by 1,600 resolution (or 3,200 by 1,440 pixels together). Thanks to those bigger screens, the HMD Odyssey also has a wider, 110-degree field of view. And as you'll see below, that makes everything seem much more immersive. When it comes to their motion controllers, the two companies are once again worlds apart. Acer basically followed Microsoft's reference design completely, similar to HP. That allowed it to get the basics down; it has a decent thumbstick and touchpad, along with the trigger and grip buttons that are so essential to VR experiences. But it's not comfortable to hold for very long, since the controller's straight handles don't rest naturally in your hands. Additionally, the buttons feel flimsier and less satisfying than what you'd get with the Vive and Rift. Samsung's controller has the same button layout, but the handles are curved slightly to make them more comfortable to hold. Its plastic frame feels sturdier than Acer's, and its buttons and trackpad are also a step up in quality. My only complaint: The top of its joystick is so smooth that it's hard to actually keep your thumb on it. It would have been nice to have ridges or another type of material to avoid slipping. Despite that, the thumbstick steel feels smoother to use than Acer's; it's more in line with what we expect from gaming-console controllers these days. Even at this early stage, there's one thing every Windows Mixed Reality headset has in common: They're incredibly easy to set up. Assuming your computer is powerful enough (at the minimum, Mixed Reality requires a fourth-generation Intel processor and an NVIDIA GTX 960 GPU), all you need to do is plug in HDMI and USB 3.0 cables and you're good to go. Unlike the Oculus Rift, which relies on tabletop sensors, or the HTC Vive, which requires installing two Lightbox devices in opposite corners of your room, Mixed Reality headsets use built-in sensors to track your movement. That instantly solves one of the biggest headaches for consumers. Setting up the Rift's and Vive's sensors can be an annoying ordeal when you just want to hop into VR. Once you have a headset plugged in, Windows automatically launches its Mixed Reality Portal, which double-checks your hardware to make sure it can run VR. You can pair the motion controllers like any other Bluetooth device -- just hit the pairing button under the battery cover and select the controller in your system settings. Finally, the Mixed Reality Portal gives you two ways to use your headset: sitting and standing in place, or walking around. If you choose the latter, it asks you to make a virtual border by holding a headset and walking around the clear area of your room. That's important, since it'll help you avoid walls and obstacles while you're in VR. Once I set up both headsets, it quickly became clear that the Samsung HMD Odyssey is simply better on every level. It's easy to put on, and it fits over my glasses without a problem. Most importantly, it's one of the most comfortable headsets I've ever used, thanks to its liberal use of premium cushions (around the eyepiece, on your forehead, on the back of your head and on the headphones). It feels similar to expensive memory foam I've seen in high-end pillows and mattresses. Upon stepping into Microsoft's virtual living room, which serves as an area to return to between VR experiences, I was astounded by how different it looked with the HMD Odyssey. Colors were brighter, and the entire environment appeared to be much sharper than with other Mixed Reality headsets. And thanks to that 110-degree field of view, I felt enveloped by that virtual world. Mostly, that's because Samsung avoided using simple circular lenses like Acer and HP. Instead, its VR screens are more like uneven ovals that are taller than they are wide. That's in line with what we've seen from the Rift and Vive. Superhot on the Windows Store looked clearer and more vibrant with Samsung's HMD Odyssey, compared to the Rift and Vive. It also did a solid job tracking my movement as I dodged and weaved through bullets and fists flying toward my head. Samsung's controllers felt just as accurate as the Oculus Touch's and HTC Vive's; I easily fired off shots at enemies who were dozens of virtual feet away. That was the case for most games and VR experiences, though I had some trouble with Duck Season in SteamVR (which Windows headsets are also compatible with). Aiming and reloading my virtual shotgun felt clumsy and awkward, even though I had no trouble playing it on the Vive. There's a good chance the developers still need to optimize that game to better support Mixed Reality headsets and controllers. I tested Acer's headset after spending a few hours with Samsung's, and it almost felt unfair to compare them. While the former is lighter and easier to put on, it was much harder to make it fit comfortably. I also grew to hate the foam padding Acer used around its eyepiece. It felt cheap and scratchy on my skin, even after just a few minutes of wearing it. It's baffling why that foam also covers where the headset sits against your nose, since it constantly presses against your nostrils. That sometimes made it a bit hard to breathe while in VR -- and yes, I tried adjusting the headset plenty of times to avoid that. Acer's model is also a clear downgrade from Samsung's once you step into VR. Since its lenses are shorter, your view of the virtual world is more like peering through a pair of binoculars rather than being surrounded by the environment. And beyond that, the screen quality was also much worse; everything looked duller and less sharp than with Samsung's headset. I still managed to enjoy several rounds of Superhot, but I couldn't shake the feeling that I was having a worse experience. After bouncing across several VR experiences, including the intimate Through You, by Lily Baldwin and Saschka Unseld, as well as several other 360-degree videos in the Jaunt VR app, the Acer headset felt adequate at best. It does the basics of what we'd want from a VR headset, but it has a hard time competing against more-impressive entries like the HMD Odyssey. Acer's Mixed Reality headset was the first we saw from Microsoft's platform, so it's no wonder it feels a bit like a rush job. It was also one of the $300 models Microsoft was initially touting as a discount entry into VR. Now, though, the Acer headset costs $400 together with its controllers. That's harder to stomach when Samsung's HMD Odyssey bundle goes for $500. There's clearly far more than a $100 difference in quality between the two. Meanwhile, HP's Mixed Reality headset, which we reviewed last week, comes in at $450. I'd still recommend Samsung's model over that, since it has far better controllers and displays. Of course, the real competitors to every Windows VR headset are the Oculus Rift and HTC Vive. Given that the Rift is now down to $400 with its Touch Controllers and it has a larger library of VR titles, it still seems like the better option for most people. You lose the convenience of built-in tracking, but you get a more vibrant software ecosystem in exchange (and it'll also work with SteamVR titles). Side by side, Samsung's and Acer's offerings seem like textbook examples of what to do, and what to avoid, when making VR headsets. The HMD Odyssey is comfortable, well-built and makes virtual reality seem incredibly immersive. Acer's, meanwhile, is none of those things. While it's still early days for Microsoft's Mixed Reality Platform, if you want to jump in, it's clear that Samsung's headset is your best option.